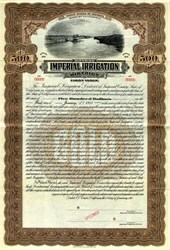 Beautifully engraved RARE specimen certificate from Imperial Irrigation District dated 1915. This historic document was printed by American Bank Note Company and has an ornate border around it with a vignette of a waterway with a dredger. This item and is over 91 years old. This is the first time we have had this for sale. 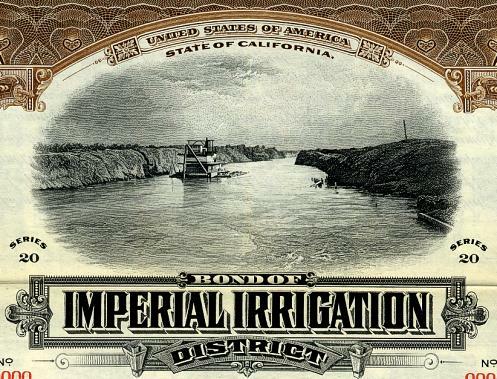 Formed in 1911, the Imperial Irrigation District was made to acquire the properties of the bankrupt California Development Company and its Mexican subsidiary. The Imperial Irrigation District had acquired 13 mutual water companies, which had developed and operated distribution canals in the Imperial Valley, by 1922. Since 1942, water has been diverted at Imperial Dam on the Colorado River through the All-American Canal, all of which the Imperial Irrigation District operates and maintains.